He’s a coach that has done and won just about everything in the game, but Clive Barker still sees plenty of exciting challenges for himself with the Team of Choice. 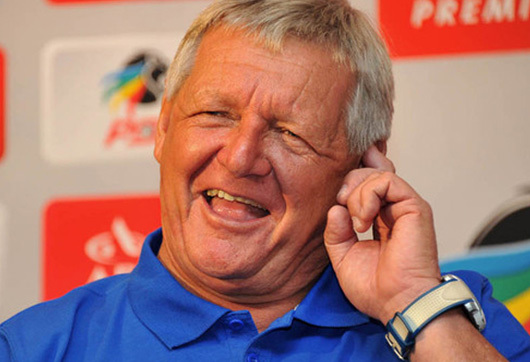 In a wide-ranging interview with the Official PSL website, former Bafana Bafana mentor Barker discusses why he took the job in Pietermaritzburg, what he thinks needs to be rectified within the team, and what he hopes to achieve at the KZN club. PSL.co.za: What was the driving force behind your latest job? Most people would have thought that was it from Clive Barker now. CB: "Firstly it was the motivation to come back home to KwaZulu-Natal. Secondly it was from the opposition, an opportunity to get out there, coach again and really test yourself against the younger brigade that are coming through in South Africa. So just generally I wanted to have another crack at the whip and so I accepted the challenge. I had been with (chairman) Farook (Kadodia) earlier in my football career and I found him very good to work with. He has a strong vision for Maritzburg United and I wanted to assist with that, so I'm delighted to be working with him again." PSL.co.za: You would have obviously weighed up the pros and cons before joining. Just how big a mess are the club in? CB: "It's basically a side that has gone from hero to zero in five or six matches. So obviously there are some problems, but these are not insurmountable because they wouldn’t be there in the first place. When they got to the top eight, they were impressive. They started off in that position on a high two when they scored two goals against Kaizer Chiefs in the MTN8, but then Chiefs recovered and gave them a beating. That was a key moment in the season and I don’t think they've quite recovered from that just yet." PSL.co.za: You touch on the Chiefs result as being critical in the broader context. Would you say then that most of their problems have been mental this season? CB: "That's exactly how one would sum up the situation. When you get a thumping like that, you lose confidence, you lose your way a bit and the results compounded matters for Maritzburg. But I have no doubt they will turn it all around. There were signs when they played (Jomo) Cosmos (in the Telkom Knockout) that they are getting there, playing a good quality brand of football and getting results at the same time." PSL.co.za: How is the mood in the dressing room since you took charge? CB: "The mood has change and that's simply because players like to hear new things. I often feel that's one of the main reasons coaches are at clubs on an average of two to three years, but there are exceptions - Arsene Wenger proved that point wrong with Arsenal. I just think that when you say things to players and you don’t get the reaction from two or three years earlier, then it's time to move on." PSL.co.za: As we mentioned earlier, you caught many people by surprise taking on another senior coaching position, which brings its own challenges, like stress for example. How much longer can Clive Barker go? CB: "As long as I'm enjoying it then I'm happy to continue. You know one day when I wake up and I say 'gee, that's enough. It's time to call it a day' then that's when I'll go. People won't tell me when to do it, I'll know when to do it. At the moment I'm very happy with the way things are, if it stays what way, I'll still be here for a long time. But I'll know when it's time to say goodbye." PSL.co.za: You've been through a lot of challenges in your career, where does this one fit? CB: "Because of various reasons, I would class this is the hardest challenge. It's not a basis of really performance, I've got to produce a performance in nearly every game. But that's okay, I like that sort of challenge. So going forward it is a big task we face." PSL.co.za: What are you realistically hoping to achieve from your time in Pietermaritzburg? CB: "Having to train the whole year, doing nothing and going nowhere, it's like kissing your aunty. I just think that there's possibilities at this club. If we can't win something in my time here, then I really shouldn’t be here. Because I genuinely feel we have a realistic chance of - A. Improving our position, B. Finishing in the top eight and C. to win a knockout competition. I think that will be marvellous. I think the league would be beyond anybody at the moment, but we're looking to be consistent in that competition and perhaps pick up something else, who knows."